MARINKA, Ukraine -- War came to this small farm town Friday night in the form of rockets that crashed into an apartment building near a rebel base, killing a man while he was watching television in his living room. It was the first such attack in Marinka, southeast of Donetsk, the rebel stronghold in eastern Ukraine’s pro-Russian insurgency, and appeared to be part of a broader advance by Ukrainian forces in the east on Saturday. The military hit rebel positions in Horlivka, a crucial town to the north, and in Karlovka, a town with a strategic bridge. But while the Ukrainian forces might have scored tactical victories, they were not winning any friends in Marinka, where the assumption was they were to blame. The attack there left five civilians dead and four wounded, according to the regional government, a grim sign of the imprecision and blunt force of the weapons being used by both sides in this war, which began in the spring when pro-Russian rebels seized Ukraine’s southeastern edge and declared independence. “Pigs,” said a man with gray hair who was wiping away tears. The source of the rocket attack was in dispute. A Ukrainian military officer, who asked that his name not be used because he was not authorized to speak to the news media, said the Ukrainians did not have artillery positions close enough to hit Marinka. “Our artillery just wouldn’t have reached there,” the officer said. A military spokesman, Vladislav Seleznyov, said that Ukraine did not use its airpower or heavy artillery against rebel targets that were close to civilians. 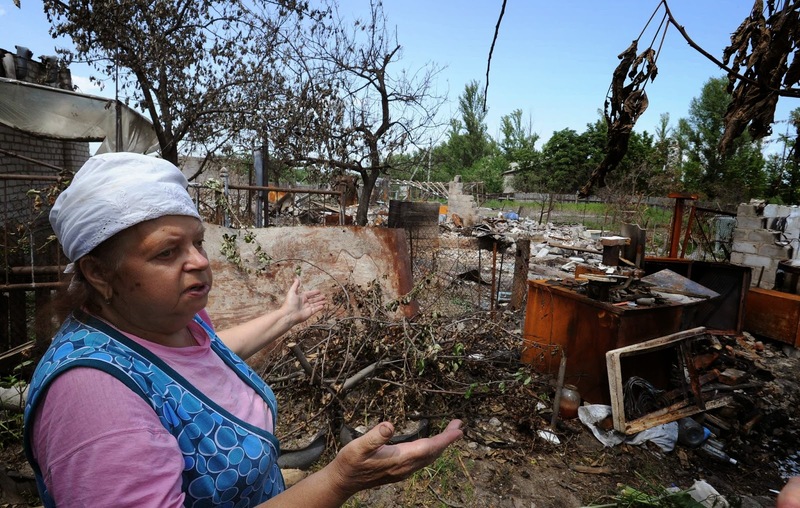 But the proximity of civilians did not stop the Ukrainians from shelling in and around Slavyansk, the former rebel stronghold they took back this month. And rebels in Marinka showed a reporter exploded rocket casings and a gaping hole in the animal feed factory where they were based, as evidence that the rockets had come from the Ukrainian military. Two rebels had been injured, they said. Across the street from the factory was the apartment building that took the worst hit, No. 6 Zavodskaya Street, a gray brick building rimmed with pretty gardens of brown-eyed susans and marigolds. A hole opened into a living room, which had collapsed in on itself. A door ripped from its hinges lay atop a large pile of curtains, cabinets and bricks. Igor Nersisyan, a retiree who lives on the second floor, said he had helped a neighbor dig her husband out from under that rubble early Saturday morning. The man, whom Mr. Nersisyan identified as Victor Belotserkovny, was dead when they reached him, the top of his skull sheared off in the blast. “They are trying to destroy peaceful people,” said Mr. Nersisyan, who blamed the Ukrainian military, as residents with bags of belongings walked away from the building. Olga Gavrilovna, a first-floor resident, was putting thawing frozen chicken into a thin blue plastic bag in her tiny kitchen; the floor was covered with the contents of its cupboards and the windows were blown out. She crunched over the glass, throwing leftover soup into the toilet, barely stopping to survey the damage. “I just can’t think right now,” she said, with a blank look. There were unconfirmed reports on Saturday that Ukrainian warplanes struck targets near Dzerzhinsk, a town north of here, killing hundreds of rebels. Both sides have made unsubstantiated claims about casualties in the past. Also on Saturday, another rocket attack killed at least four people on the southern edge of Donetsk. Local residents said the attack took place around 4 p.m.
By evening, businesses and homes were still in flames, and bodies lay outside a building that had been hit. One of the bodies appeared to be that of a girl in her early teens. It is possible that the rebels were receiving reinforcements. The state news agency of Ukraine, Ukrinform, reported Saturday that militants had crossed from Russia into Ukraine in the Krasnodon district, near the village of Veliki Sukhodil in a large convoy of armored vehicles, including tanks. That claim has not been verified. In Donetsk, leaders of the rebel movement gave their version of the events in Marinka. Igor Strelkov, the Russian citizen who is the military commander of the rebel forces here, said the Ukrainian armed forces had struck a milk factory as well as the animal feed factory; he claimed that more than 30 people had been killed, despite the lower figure provided by a local official. “This is a relatively standard picture for the Ukrainian military,” said Alexander Borodai, another Russian citizen, who along with Strelkov leads the insurgency here. Despite all of that, the rebels seemed to be in a light mood. A wedding of a rebel commander, known by the name Motorola, took place on Friday in a large ceremony at a central hall filled with fighters holding their guns. Rebel forces also announced a singles night in Lenin Square for local women to meet fighters. “We await everyone who is looking for a dependable, courageous, real man,” Pavel Gubarev, a rebel commander, said in a Facebook posting. Borodai, who usually wears fatigues, was dressed in civilian clothes — a sharp blue blazer, jeans and blue suede loafers. When asked for his response to the European Union’s recent decision to impose sanctions against him, Borodai seemed to take pleasure in the answer. “It’s unfortunate, of course, that in the near future I can’t visit Europe or walk around European towns,” he said, noting that he especially liked Austria, Germany and the south of France. “But it doesn’t scare me. I’m even happy, because I have excellent company,” he added, turning to Strelkov and smiling.